Today is International Missing Children’s Day and I wanted to share with you all the story of Liz Westwood, an Australian mother whose daughter Suzie, 16, went missing in 1987. On February 7, Suzie went to a party at Healesville Memorial Hall. She was last seen the next day, before disappearing without a trace. Healesville is a rural town and tourist attraction in Melbourne’s outer east and in 1987, it was very much a place where everyone knew one another. As part of a multimedia project I did in 2012 called Unsolved East, photojournalist Eugene Hyland and I travelled to Liz Westwood’s home to speak with her about Suzie’s disappearance. The video interview can be found here on YouTube. It is a baffling case. 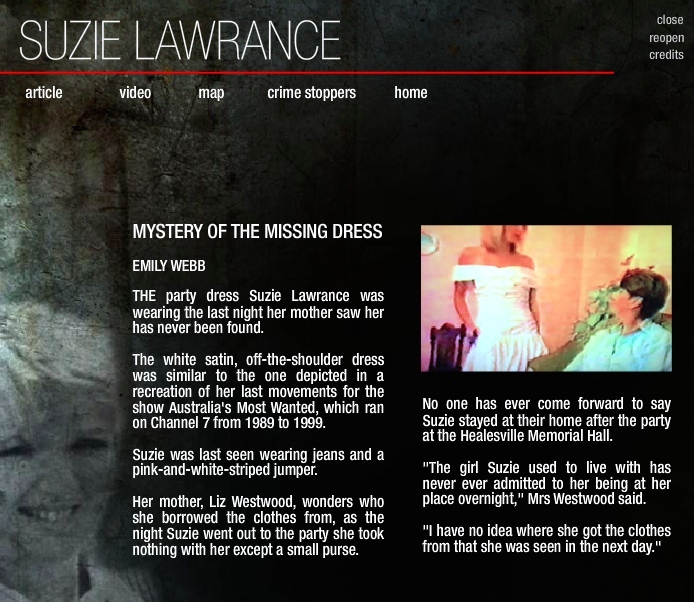 Liz has never heard from her daughter since, nor has any of Suzie’s brothers. As Liz told us, Suzie was very close in particular to one brother and she said it made no sense that she wouldn’t have at least contacted him over the years. An aspect of the case that i found really strange was that the party dress that Suzie wore to the 21st birthday party – a white taffeta dress – has never been found (see story below. The picture is from a television recreation of her case). Suzie would have had to change from her party clothes as she was seen the next day at a music festival in nearby Yarra Glen. Someone must know what happened to Suzie?